I'm sure we'll see worse films than Sicario: Day of the Soldado this year. But few will be as uncomfortable. Denis Villeneuve's original walked a tight line between exploitation and exasperation as a drug war thriller made of somber disillusionment and sorrowful contemplation of violence. Its sequel, having ditched Emily Blunt's conscience character, gestures in the direction of complicated cognitive dissonance from time to time, but is from beginning to end a total failure of moral and political imagination. Coming from the same screenwriter as the first, Taylor Sheridan's writing loses its suffusion of soul sickness. This is an incoherent text, effectively crafted for suspense and sick thrill of squibs and process, but building from ugly assumptions and getting a stomach-churning kick out of its bloody violence. Worst of all, there are passages of Sicario 2 that are as slobberingly racist as any you're every likely to see. It opens with a horrifying sequence: terrorists sneaking across the U.S./Mexican border and blowing themselves up in a Kansas grocery store. It's a Fox News fantasy vividly acted out, a drooling white supremacist daydream of bad brown people swarming over the border compelling a bloodthirsty response from the pasty suits and sunburned grunts ready to enact righteous violence. The movie is so thoughtfully, expertly constructed on a level of craft - director Stefano Sollima orchestrating tense firefights and car chases, crisply photographed by Dariusz Wolski - that its ill-considered content is all the flimsier, and unforgivable. The film quickly hopscotches between Somalia and Mexico, tracing a returning DEA agent (Josh Brolin) on his circuitous path to pinning the act on a kingpin and receiving permission from the government to secretly cross the border and start an inter-cartel. To do so, he calls in Benicio del Toro who walks in as if from a better movie and threatens to make this one watchable. That the movie manages to claw itself to a stasis that's relatively compelling is quite a feat, but starting with in a place of such nasty prejudice and fevered feeding of some of our country's most deplorable citizens' worst ideas forever marks the rest as inescapably incoherent. Sure, the agent played by Catherine Keener has a monologue where she snarls that the president is cowardly, and more worried about getting impeached than micromanaging targeted killings in foreign lands. And the plot proper kicks in when Del Toro saves a Mexican girl (Isabela Moner) who has been kidnapped from her father by the Americans as a pawn in a political game. But the entire thrust of the film is built on the backs of dead Mexicans, gunned down in each and every action sequence, the only expendable characters in the entire narrative. They're flung back with brutal splats, bodies left piled high. Other Latinx supporting characters - even a Mexican-American middle schooler who is almost entirely tangential to the story - have their entire purpose built in relation to crime. There's a perfectly fine, tense little suspense picture underneath all these stereotypes. But it is precisely these unexamined ideas, used here as mere fuel for summer entertainment, that have poisoned our society for so long. Jurassic World: Fallen Kingdom has the unfortunate responsibility to carry over characters from its predecessor. If it hadn't, it could've saved itself a lot of tiresome hurry-scurry exposition explaining how the nothing characters played by Chris Pratt and Bryce Dallas Howard ended up back in the action this time around. I get it. Colin Trevorrow's Jurassic World was a huge financial success, but, forget how visually bland and narratively bunk that junk movie was for a moment and think of its heroes. You only remember them because they were played by recognizable actors. They are sub-cardboard creations, fictional people with no inner lives and certainly no coherent motivation. The new movie finds Pratt (he's playing a...zookeeper? Safari leader? Handyman? I honestly couldn't tell you) recruited by Howard, who used to run the now-defunct Jurassic World and is currently a dinosaur rights activist, to go back to the island and save the prehistoric beasts from a volcanic eruption that will wipe them all out. This is an unpopular opinion among many humans who saw what went down in the last movie and decided that maybe these scientific revivals are a bad idea. Nonetheless, off our nobody heroes go, ready to save the dinos. I couldn't be compelled to care. What's wonderful, then, is to discover director J.A. Bayona (the expert craftsman behind The Orphanage and The Impossible), working with a screenplay by Trevorrow and Derek Connolly, shakes off all this rigamarole setup to become something sleek, silly, and scary. It's also introducing honest-to-goodness characters -- still flimsy, but at least they're Rafe Spall, James Cromwell, Toby Jones, and Geraldine (!) Chaplin (!) -- and the most compelling sequel scenario this franchise has ever concocted (if only because it dares to be so big and so wild). Besides, the best way to enjoy any Jurassic Park sequel is to go in knowing it'll never be anywhere close to as good as Jurassic Park. I dare not spoil the surprises in store that lead to a film that turns increasingly into a haunted Hammer homage with dinosaurs instead of ghosts or vampires. I'll just say there is: a big creepy mansion, a mad scientist, a room of ghoulishly rich people, an adorable and mysterious little girl (whose big secret is the wildest swing the movie has prepped), a basement full of cages, an ailing elderly patron, a shifty business manager, and much more! Bayona slides the camera around corners and catches shafts of light in full moody twinkle. As the finale roars to life on an actual dark and stormy night, the windows glisten and shake and lights flicker. Michael Giacchino's score works a swirling strain of Universal monster movie bombast. Creatures lurk down hallways and in dark shadows. Much use is made of dumb waiters as a convenient means of escape. Starkly lit evil monologues and crisply cross-cut scurrying are leavened by jolting jump scares and effective side characters whose quipping fears cut the tension. (I quite liked Daniella Pineda's scientist and Justice Smith's computer whiz, who are always good for a reaction shot.) It's nothing much like the duller early island-bound sections, which are dutifully scooping up after the last film and pushing the pieces in place for a new idea. Even there, though, Bayona finds wonderful little stylish turns, like a dinosaur schlepping down a concrete pipe, heard but unseen save for flashes of light thrown by spurts of lava. It's a movie caught between being silly nonsense and great trash, but luckily leans more to the latter. There's a spirited B-movie what-the-hell energy to its loud A-budget set-pieces, and a pleasant smallness to its back half, contained and even downright downbeat as it climaxes finding the Jurassic World taken to its logical extreme. 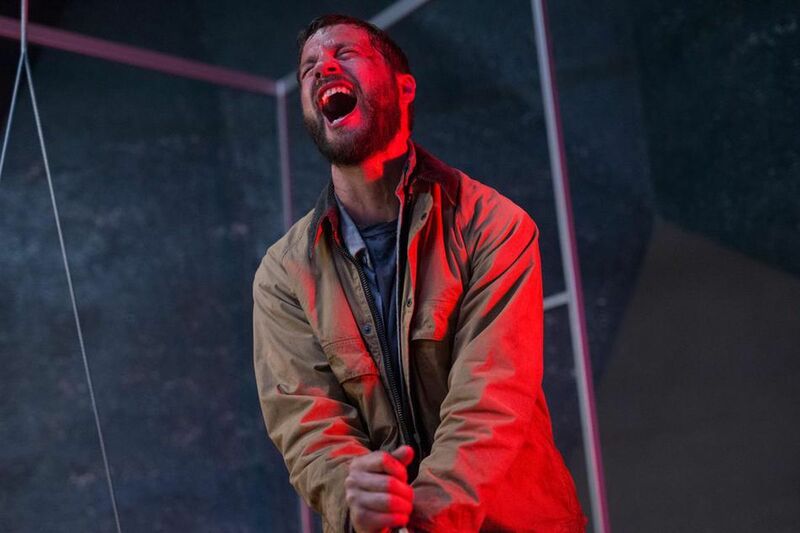 Upgrade is the cure for the common summer movie. It's a small, scrappy sci-fi action/thriller shot with energy and filled with creatively derivative ideas. Writer-director Leigh Whannell (who earns a hearty most-improved in my book after his dismal debut feature Insidious 3) keeps the stakes small, but the verve big. He builds a convincingly livable future world and uses the logic of its construction to twist standard old pulp revenge elements into something freshly compelling and immediate. It uses its relatively small budget smartly, styling imaginative action sequences with a visual flair built out of clever camera tricks and a marvelous lead performance that's trickier than it even looks. Logan Marshall-Green stars as a man left paraplegic after his wife's death at the hands of thieves who attack after a self-driving car accident. (Or was it an accident? The movie has all the cyberpunk noir uncertainty you'd want.) He's offered a chance to walk again by a shadowy tech billionaire (a perfectly sniveling pretty youth tycoon played by Harrison Gilbertson) and, seeing as the alternative is despair, he takes the chance. A tiny experimental computer is inserted into his spine, allowing energy to flow from his brain back to his limbs. It's a miracle. But there's a twist. There's now a voice in his head. It's the computer. It wants to help its host get revenge on his wife's killers. To do so, it wants control. Where the movie goes next is largely unsurprising, but deft and satisfying in the way it piles on complications and future-shock bio-tech ideas (like a baddie with a gun implanted in his arm like a Cronenberg design). A large portion of the appeal in the film's escalating entertainment is Marshall-Green's performance, as he becomes an alternately scared and emboldened bystander in his own body. As he heads out to find vigilante justice -- cross-cut with a determined detective (Get Out's Betty Gabriel) suspicious of the mounting body count that was her suspects -- the computer turns him into a kung fu master. The machine controlling him allows his body to anticipate attacks, systematically taking apart his combatants in dizzying flourishes of robotically fluid physicality. (Also, in the neatest trick of all, it helps him draw by having him grip a pencil, then moving his hand rapidly like an inkjet printer.) It's fun enough to watch well-choreographed punches and kicks mixed in with explosively gory uses of everyday objects. There's a whole other layer of delight when the man doing this action wears a look of overwhelmed surprise. The camera sticks close to the body, turning and pivoting and panning with smooth, eerily composed moves, as if the film itself is in sync with its hero's digitally enchanted reflexes. His face and his movements are eerily separated, and impressive feat of whole-body acting. As the techno-thriller reaches its conspiratorial fever pitch, it digs into its revenge element's prerequisite cautionary tale while dovetailing with technology run amuck paranoia. It's a sweet twofer. All this fun and done in barely over 90 minutes? What a blast, and what a nice surprise, to leave the multiplex's latest offering wanting more in a good way.